Ace Frehley has always been my favorite member of KISS. From the time I was a young kid in 1977 when I discovered KISS, straight through to present day, Ace Frehley has always been one of my guitar heroes and one of the reasons KISS is my favorite band. He had that outer world persona, the cool silver, black and blue makeup with matching costume, that made him look more like a superhero than the rest. The focus was always on Gene Simmons & Paul Stanley in magazines and interviews so I always waited for an article featuring Ace but there weren’t as many and this gave Ace an extra aura of mystery to me. Back in the early ’80s when I started to really get into music, I started to look at KISS as more than a superhero, comic, cartoon entity and that of an actual band. I started to collect their albums on cassette, paying close attention to every small detail I could find in newspapers, magazines and record stores about each record. By the time KISS released CREATURES OF THE NIGHT (1982), I had almost every KISS album on cassette except the solo albums and THE ELDER (1981)…..these albums had become scarce due to their cut-out/delete bin status. First on my list…..Ace Frehley. I remember exactly where & when I bought my Ace Frehley solo album cassette – Good Vibrations in Seekonk, Massachusetts for $7.98 sometime in the Fall of 1982. Every weekend my mom would go to the Seekonk to do food shopping at the area’s first mega-grocery store, Heartland, and it was always packed. This turned into a 2 hour odyssey every weekend so I would go to the Good Vibrations in the same plaza and look at ALL the vinyl, tapes and magazines and that’s how I got my Metal education. Back then I had a want list and all the missing KISS album were at the top…..but on cassette! That store had tons of vinyl (this was before CDs took over) and they had copies of all four solo albums but I needed the cassette and it wasn’t in the “K” section of the cassettes…..until I asked the guy at the counter and he found it under “F” for Frehley! That is something that gets discussed regularly, especially by KISS fans, is it a KISS record or a solo album? Technically it’s a solo record but unified by the band name KISS so I always file my solo albums in my KISS discography. Enough of my collecting rules, on to the album! As many a young kid my age did back in the day, you listened to the first couple of songs on each side first because you knew they were probably the best songs. Then you hit <<Rewind>> and listened to those first couple of songs again and again until they were etched into your mind. If you knew which songs were the hits, the single, then you could get to the rest of the tape later. I knew from KISS articles in magazines that ‘New York Groove’ was played on the DYNASTY tour so I re-wound Side 2 and listened to that song first…..a lot of the time I would let the tape run into ‘I’m In Need Of Love’. Same thing with Side 1, ‘Rip It Out’ was the official single and I played that over and over, letting the tape run so I knew ‘Speedin’ Back to My Baby’ as well. These four songs were the entire basis for me listening to this album and it wasn’t until months after I bought, maybe even a couple of years actually, until I started to listen to the album as a whole. ‘Rip It Out’ and ‘Speedin’ Back To My Baby’ sounded like typical KISS songs sung by Ace so I really got into them quick but ‘Snow Blind’ and ‘Ozone’ were songs that I couldn’t get into right away. Both songs seemed weird to me back then and, when I was told by some older metalheads in my neighborhood that the songs were about drugs, I didn’t like them. Remember “Say No To Drugs”? Once I started listening to them I started to like both songs because they were different, spacey, kind of out there just like Ace was. Now these two tracks are couple of my favorites on the record. Last song on Side 1 is ‘What’s On Your Mind?’ and it is definitely a lost Ace classic that has a really catchy melody and chorus…..it’s one of those songs that gets you singing along right away and it could have easily fit on LOVE GUN (1977) or even DYNASTY (1979) a year later. I think this is one of Ace’s best vocal performances on the album. Side 2 opens with the DYNASTY tour performed ‘New York Groove’, a song written by Russ Ballard and previously recorded by a British Glam band, Hello, in 1975. Now I didn’t know that this was a cover song back when I bought the album and I have never heard Hello’s version so my long standing rules against cover songs doesn’t apply. I knew this was a song KISS played live, it was the only hit single from any of the solo albums (#13 on the Billboard charts in 1978) and it was a catchy song that instantly stuck in my brain. ‘I’m In Need Of Love’ is a spacey kind of song, similar to ‘Snow Blind’ and ‘Ozone’ with different guitar techniques and sounds. I’ve always liked the song, it has this mid-tempo pace that borders a ballad at some points but the song picks up at the guitar solo…..one of my favorites on the record. The title is a pure KISS type of song title so that was another reason I gravitated to it. Back in the day I didn’t care much for ‘Wiped Out’ or ‘Fractured Mirror’, I always thought that the opening surf-styled guitar riff was corny and I never really cared about instrumentals. Today I’m a huge fan of ‘Fractured Mirror’ but ‘Wiped Out’ is probably my least favorite song on the album. ‘Fractured Mirror’ had turned into one of Ace’s signature moments and he uses it to this day as an intro when he hits the concert stage., I still find ‘Wiped Out’ a little corny but the song takes on that spacey kind of feel like ‘Ozone’ or ‘Snow Blind’. 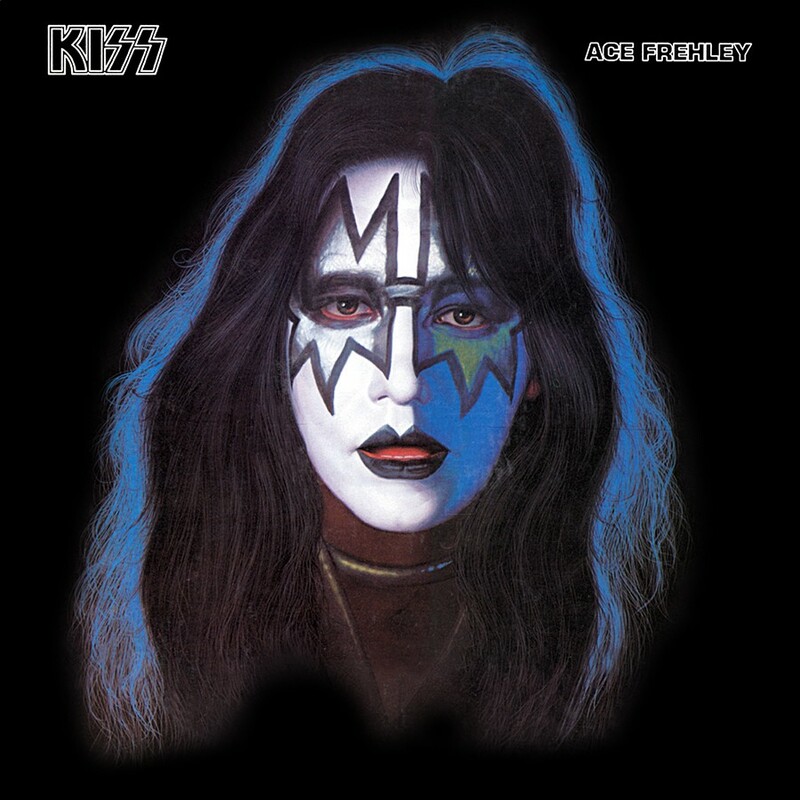 For me, the best solo album is the Ace Frehley solo album, not just because he has always been my favorite member of KISS but because the album is an extension of what Ace had done up to that point in KISS. The songs sound like Ace sung KISS songs but there is a lot of experimentation, a lot of freedom with sound and guitar effects, that could never fit onto a proper KISS album. I like every song on the album, even ‘Wiped Out’, and you can tell that Ace put all his creativity into making the record, I also think that his vocals on this record were more confident and better than anything he had sung with KISS at that point in time. From a personal historical standpoint, this was the album that made me seek out the other three solo albums, in the hopes that they would be just as good, and started me following both Ace’s and Peter Criss’ solo careers. I own the original cassette I had from back in the day and that is an original Casablanca Records pressing, not a Polygram Records reissue…..I also have the first pressing on CD through Polygram and the 1997 remaster. I would like to track down an original pressing vinyl LP with the poster but those go for big bucks online or at conventions. Love this lp, love Ace and KISS, and I really enjoyed reading another fans story on when they first got it and what that experience meant to them. I remember spinning that LP so many times that i wore IT out as well as the needle on my turntable. Classic tracks, simple riffs and melodies that rock! Gene was always my favorite member of KISS since I got into the band in ’78. I like his songs best usually. And I like the “Demon” character (I like monsters). So, his was the first solo LP I got when they first came out. And next I got Paul’s, then Peter’s. I got Ace’s last because I assumed it would be the worst of the four (I didn’t particularly care for “Shock Me” or “2000 Man”). But his album is, as you said, the best of the four. Great post. The first KISS solo album I purchased was Paul Stanley on, get this, 8 track. I was in eighth grade, and I bought it at the Listening Booth in Hanover, PA. Paul was always my favorite member of the band. I thought his voice and rock star persona were really cool. My Ace Frehley solo album is a cut-out. If not for the cut-out, the album is in unreal excellent shape. I used to have the 45 rpm of New York Groove… darn it all, I wound up trading it away years ago. Your vivid memories detailed in this post are great elements. My favorite KISS solo album is Paul Stanley… and I do take some heat for it! I revere the Ace Frehley album too, I’ve just always been a sucker for Paul Stanley’s vocals. No matter what though, this Ace Frehley album is an unreal great Classic of Classics! Kiss is really the best ever hard metal rock and roll band in the universe. Ace Frehley has always been the greatest lead vocals with the make up and the costume that makes him different from the rest. Totally the best. I knew Ace Frehleys solo album was going to be the best one. He’s the best musician in the band. Gene Simmons solo album SUCKED!! He’s a freakin demon. I was expecting God of Thunder not Farie In Boots. Man Gene’s was the biggest disappointment of all. Peters was cool. That’s who he is. Paul Stanley… well when it comes to guitar playing he doesn’t hold a candle to Ace Frehley. Hell I know I smoke Paul Stanley on guitar. His album I thought was average. He’s kinda feminine and so was his solo album. Ace just plain simply rocks! WHY? Because he’s a good musician and made the right song choices and gave the fans what they wanted & Ace just rocks naturally too. He’s a true rockstar! He’s why I started playing guitar. I’m in agreement on several things in this review, but I disagree with one thing. I don’t think Ace’s is the best, I think Paul’s is better, but only by a bit. I do remember thinking when these came out that Ace’s wouldn’t be very good because I didn’t like his voice. I was wrong about the quality of his album, it’s outstanding. And his voice, although I don’t think he’s a “great vocalist”, has definitely grown on me. I prefer him being in the band and singing 1-2 songs per album, but that’s just an opinion. I fully agree on the best 4 songs. I also fully agree with the assessment of the solo on I’m In Need Of Love. It is phenomenal and I love the way it speeds up. Ace blazes on it. And I’ve always loved Fractured Mirror. The bell ringing takes me straight back to elementary school where a friend of mine wore a t-shirt for this band named Kiss that just knocked me out. I can still picture the playground when I hear the song. I have all 4 albums on vinyl, but they aren’t in the greatest shape (I really didn’t take care of them like I should have). I think I have them on cassette as well, and I definitely have them on CD.